OtterBox has a reputation for producing high quality, stylish cases. 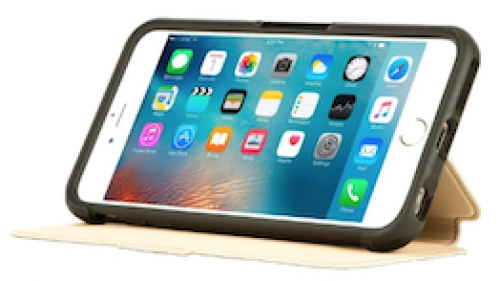 I had the pleasure of reviewing an iPhone 6 Plus/6s Plus case from their Strada Series. 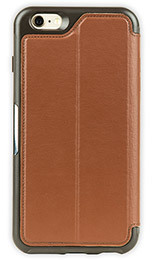 The Strada case combines a folio with a cardholder encased in premium leather. 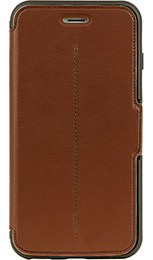 This is the first case from OtterBox to use genuine leather material. Installing the iPhone into the folio required simply snapping it into the folio. To remove the phone from the folio, you have to open the folio, pull back the edges surrounding the phone, then pop the phone out. The typical cutouts on the bottom are available for speakerphone, charging, and earbud use.The case surrounding the phone has covers for the volume buttons with really good touch feedback. There is also a cutout for the silent/vibrate switch. With cover closed there are indentations that allow access to the volume buttons along the side of the closed case. And on the other side of the closed case there’s a cover for the power button while on the back there’s a cutout for the camera and secondary microphone. The cover can also be folded back and used as a stand to support the phone during hands free use. Unlike a lot of folios for the iPhone, this case is slim with an attractive design. This slim design makes it easy to slip into a pocket or purse. The leather, soft to the touch with stitching around the edges and down the center giving it a more luxurious look, covers a polycarbonate shell which insulates the phone from drops. The folio cover has a metallic latch embossed with the OtterBox name that folds over the phone screen for added protection from scratches in the closed position. The latch also secures the folio in the open position keeping the cover from flapping which is great news for runners. The inside of the folio cover is lined with a microfiber material and has a vertical slot that could probably hold a single card and a couple of dollar bills. After using an Apple leather case for over a year, I was excited to review a new case for my iPhone 6 Plus. I had great experiences with previous OtterBox cases that I’ve owned. The Strada Series Case for iPhone 6 Plus/6s Plus exceeded my expectations. The premium leather and styling as well as excellent protection makes it worth the higher price. However, it’s the slim folio design that moves this case into a different class from traditional folios. In the past, bulk was a given when you decided to go with a folio. OtterBox has put an end to that wth their Strada Series.